Amazing volcanic rock terrain, black sand beaches, dramatic any-photographer-envy lighting, volcanic belts and wonderful people. It’s beautiful, unpredictable, ecologically clean, unique in so many ways and independently strong! The first thing you should do is rent a car and buy all possible insurance they offer. Volcanic rock and ash are nasty, and if you want to go outside Reykjavik (which you certainly do) you will inevitably end up driving on unpaved roads, and those roads aren't smooth and are full of sharp rocks. Spend a few days in Reykjavik - it's a great way to get to know the country, its people and the culture. 1. Walk up and down Laugavegur during the day and at night, which is the main street in Reykjavik with lots of cool shops, bars and restaurants. There is a nice cafe Sandholt (36 Laugavegur) with great pastries and a cozy lunch spot that serves delicious soup in bread bowls Svarta Kaffird (54 Laugavegur). 2. Walk around Downtown Reykjavik. Stop by the Reykjavik Arts Museum and HARPA Concert Hall (check out their performance schedule). Grillmarkadurinn (Laekjargata 2A) and Fiskmarkadurinn (Adalstraeti 12), by the same owner, have fantastic grill and fish. A much more casual but delicious place with local food and great selection of beer is Islenski Barinn (Ingólfsstræti 1). 3. One other great spots for a quick but delicious bite is Old Harbor. Sagreifinn is in all guidebooks for a reason - you should absolutely try their lobster soup and fish skewers. Cafe Haiti has some good sandwiches to snack on (and we ran into Bjork there, haha). 4. AURORA. Go to Aurora Reykjavik - Northern Lights Center. You will learn everything about aurora hunting there: from what websites to follow to what camera settings to use. Talk to the workers there and ask any questions! We found that the best places near Reykjavik to see Aurora are Grotta Lighthouse (and near by parking lots) and anywhere off the road toward Keflavik airport. Be aware that besides strong aurora activity, you need clear sky. Iceland gets a lot of precipitations and is frequently covered with clouds that prevent you from seeing any of the beautiful aurora lights. The result of our deliberate aurora studying and hinting!!! Grotta Lighthouse in Reykjavik. Right next to Aurora Reykjavik is Saga Museum (a quick history lesson on Iceland) which also has a great restaurant good for coffee of dinner Matur og Drykkur (Grandagarður, 2). 5. If you want to do some shopping, go to a mall. I loved Kringlan! The main reason why yo want to go to Iceland is it's amazing nature, unique terrain and unpredictable climate! Once outside of Reykjavik, there is pretty much one main road that circles the country. 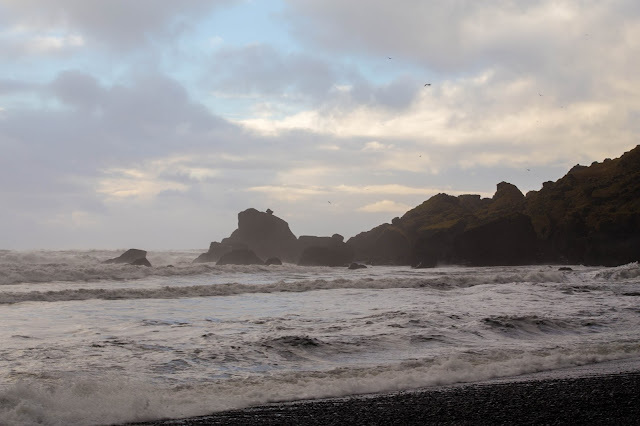 In about 5 hours we reached Vik, a beautiful South Iceland town known for its Black Sand Beaches. Near by, there is a well known volcano Eyjafjallajökull, which you can hike or snowmobile on. Check out numerous beautiful waterfalls on the way down south (Skogafoss, Seljalandsfoss and others), check out Solheimasandur plane crash site and just jump out of the car anywhere along the road to take photos, cause it’s breathtaking! 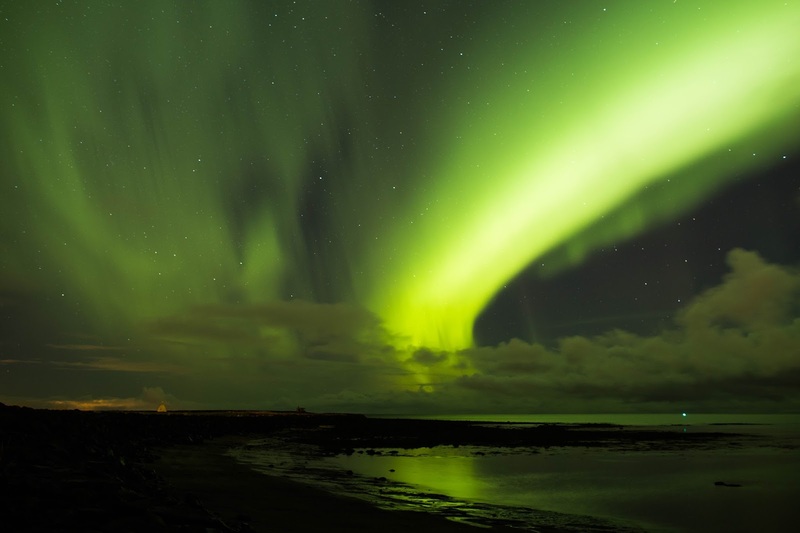 The aurora watching outside of Reykjavik must be amazing!!! We only captured aurora in Reykjavik, as it was raining during the night we traveled down south. Hopefully you will make it to the east coast and will see drifting ice. Horseback riding on the short Viking Icelandic horses looks like a ton of fun. Check out adorable puffins on Vestmannaeyjar (Westman Islands), I believe the season is April-September.